Digestive health is very important to your overall well-being. Learn how to improve your health by learning from Rebecca Harder a certified Colon Hydrotherapist. This is an entertaining and informative book in which you will learn potentially life saving information of a commonly misunderstood subject. In perilous times like these, where health truth is hidden behind a gigantic wall of contradictory and often harmful misinformation, a resource guide can be quite helpful. Rebecca Harder (aka... Gastra-girl) has come to the rescue with this compilation of articles on natural modalities and resources that are simple, effective and easily accessible. Unfortunately, it is likely your doctor will not tell you about them. Why is that? Because these healthy resources put you in control of your own health and take the dollars out of the pockets of Big Pharma. If you are searching for nature's way of healing, then Gastra Girl Resource Guide introduces these natural therapies for further investigation. Rebecca Harder is a National Board Certified and I_ACT Certified at the Instructor Level COlon Hydrotherapist. Since 2003 she has given over 20,000 professional colonics and wellness consultations with the unique approach of following "the body by design". In this illustrated book, Rebecca Harder joins forces with a Super Hero to explain the value of the colon and how to care for it! In this remarkable book, a National Board Certified Colon Hydrotherapist joins forces with a Cartoon Super Hero to explain the value of the colon and how to care for it. Is it a Cartoon or a Physician's Manual? At first glance you might think this is a clever comic book with a catchy title. But it is actually one of those “hush hush” books you might not want anyone to see you reading. However, that is the problem. This book is on a subject the average American does not want to think about, but just might save their life if they did. This book is about - the neglected and misunderstood colon. Even more “taboo” than talking about your colon, this book pushes the boundaries of medical disclosure. It discusses natural modalities the medical establishment, pharmaceutical and insurance industries do not want you to access and have gone to great lengths to suppress. The book Gastra Girl is authored by Rebecca Harder, a National Board Certified and I-ACT Certified Instructor Level Colon Hydrotherapist. She has performed over 10,000 colon hydrotherapy sessions since 2003 and is the owner of Portland’s premier cleansing center, Colon Care, LLC. Based on her research and years of professional experience, this book will provide detailed information on the subject of colon care, including colon cleansing or as it is also called: colon hydrotherapy, colonics, high enemas, therapeutic enemas, and colonic irrigation. If it is so great, why hasn't my physician told me about it? You may not have heard of colon hydrotherapy, but it has been practiced for thousands of years by kings, celebrities and medical authorities throughout history, to only be “systematically removed” in the U.S.during the last 60 years. People and organizations such as King Louis the 14th, the adventurers Louis and Clark, the U.S. Navy and the beautiful Princess Diana, have gently cleansed their colon to have a greater degree of wellness, beauty or longevity. This book will be based on the works of such great physicians / practitioners as Max Gerson, Bernard Jensen, Weston Price, J.H. Kellogg, V.E. Irons, Norman Walker, and many others over the last 100 years. Unfortunately you won’t find this incredible information in today’s mass-marketed “Best Selling Health Books” or in most medical offices. Because the subject matter makes most people uncomfortable, the book is illustrated with a cartoon superhero, Gastra Girl. Complete with mask and cape, she truly is the “star of the show”. She will be highlighting key points and making light of this important but sensitive subject. The illustrator Kim Bruce, is a commercial graphic artist and without her talent you might be afraid to find out just how valuable your colon is. 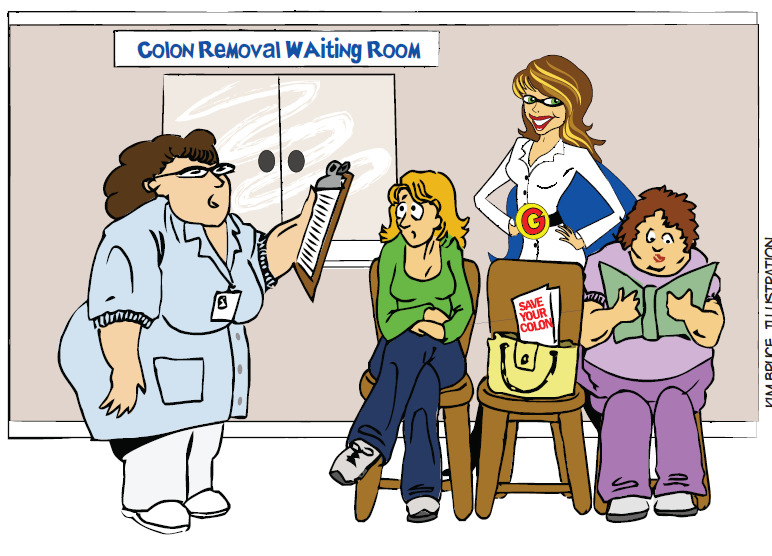 The Gastra Girl illustrations will help you “be brave” and learn about colon care from a straight forward and at times, humorous perspective. (To see some of Kim Bruce’s artwork, visit http://www.kimbruce.net). YOU could benefit from the information in this book. Colon Cancer is the second leading cause of death in the US, and it is a silent killer. Ever year over 100,000 people have their colon removed annually. 142,570 people were diagnosed with colo-rectal cancer in 2010 and over 51,000 people died from colo-rectal cancer. Over 62 million americans are diagnosed annually with digestive disorders and over 236,000 die annually from digestive disorders - (over 4,500 people per week). More than 4.4 million Americans suffer from Constipation and more than 5 million Americans suffer from IBS. Have you considered the medical establishment’s solutions to colon cancer? They offer removing all or parts of the colon, chemotherapy, radiation, or at the very least, costly medication. (Americans spend over 200 BILLION annually on medications). Very few doctors are educated in natural modalities and most don’t tell their patients about them. Fewer still are those physicians who have actually experienced a colonic. Could it be that the medical establishment won’t tell you about it because colon cleansing does not sell pharmaceutical drugs and the medical establishment does not profit if you are healthy? Although we invite everyone to read this book, it will NOT cover diseases such as Cancer, Crohn’s, Colitis, Diverticulitis, IBS and other digestive disorders. Nor will it give benefits, cures, treatments, etc. It is far more beneficial if the book focus on what “WELLNESS” is and HOW to “be well” in a toxic world. This book is for any person interested in knowing how a healthy digestive system functions and natural modalities to care for it. It will be a great way to share the colon health message. It is also written for any physician, health care practitioner or colon hydrotherapist to offer their patients and clients. "Rebecca Harder's professionalism in delivering treatments that help heal chronic disease give me absolute confidence that she can write an outstanding book on colon cleansing and natural modalities." "This will be a great book for my patients,and the professional and amateur athletes I work with, to better their energy, performance and digestive health with colon cleansing." "Rebecca Harder’s book "Gastra Girl" will be a valuable resource I can use with my patients. "